Contra Mestre ‘Gringo’ - Leo Santos is affectionately known as the ‘Face of CAPOEIRA’ in Perth WA. CM Leo started his first steps of CAPOEIRA as a young boy back in 1985, his CAPOEIRA experience since then has been long and diverse. 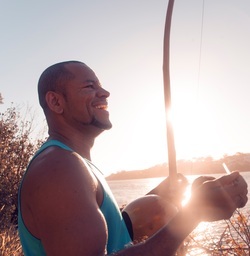 In 2001 CM Leo arrived in Perth and from that moment he has dedicated himself to teaching & promoting CAPOEIRA and Brazilian culture in Perth, Australia and on the International stage. Coming from humble beginnings in Montes Claros - Minas Gerais Brazil, Leo has been through tough, traditional training & has gained considerable CAPOEIRA knowledge; consequently he is now a leader in his field. Contra Mestre ‘Gringo’ offers the highest standard in teaching bringing the most up-to-date techniques to his students while being dedicated to keeping the traditional foundations of CAPOEIRA & Brazilian culture secure. With CAPOEIRA classes in the Perth CBD & around the metro area, we are easily accessible & are a must for the most fun to have while getting fit & learning something unique! See you in our CAPOEIRA CLASSES soon!! Leonídes Ferreira Santos was born into a humble family in the small farming community of Coracao de Jesus Minas Gerais, Brazil. He is one of 8 children, when Leo was 6 years old the family moved to Montes Claros. For many Sundays Leo would watch capoeira roda’s at the local park until one Sunday when he was 12; he had the opportunity to talk with a man sitting under a tree playing a berimbau this was Leo’s first ‘up close’ encounter with Capoeira. Leo realised from this chance meeting that he had to follow his life’s calling - Capoeira. Leo began practising with his friend “Umberto” who was a capoeirista in a local school. Training for Leo was in the backyard as classes were too far away to travel to. In 1989 a new Capoeira academy under the direction of Mestre Marreta opened close to Leo’s house he joined the group and began his journey to becoming a capoeirsta. In 1993, 2 of Mestre Marreta’s international students from Europe invited Leo to travel to Sete Lagoas to visit and train with M. Marreta’s students. From there their journey took them to the state capital, Belo Horizonte (which resulted in Leo’s nickname being given to him by his close friend Gloria - today he is affectionately known in the capoeira world as ‘Gringo” which translates as foreigner - (because his friend's were foreigners, then he must be too!). With an introduction from Gloria the 3 capoeiristas met Mestre Pintor, Leo realised he was ready for further development in the art, game and culture of Capoeira. It was at this time that Gringo received the 1st of several very tempting offers to teach overseas, but he felt compelled to follow his life's calling & dedicate himself to training in Brazil. 2 weeks later the European students returned home and Gringo accepted Pintor’s invitation to join his fledgling group. After many years and enormous effort, commitment and study Gringo acquired the technical qualification necessary to teach classes in Capoeira. Now he felt he was ready to make an honest & vauable contribution to teaching & promoting Capoeira and Brazilian culture overseas. In Brazil and throughout the world, Gringo is recognised and welcomed at events run by other groups, travelling around the country and now internationally to promote the arts of our ancestors. Since 2001 Gringo has travelled to Australia many times to promote and teach his knowledge and skills in Capoeira. He is now living in Australia permanently and is an Australian Citizen; he has a following of many dedicated young capoeiristas. We are fortunate to have C. Mestre Leo Santos heading up WA’s Ultimate Capoeira school right here in Perth. 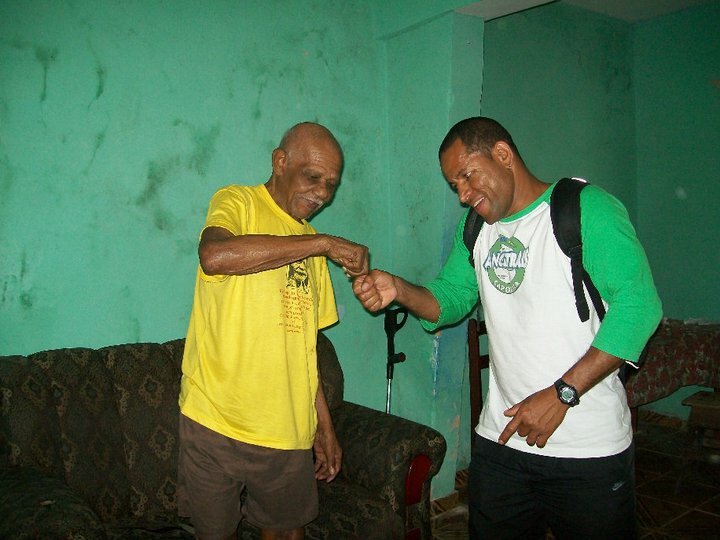 He is celebrated nationally and internationally as a leader in his field and is recognised by his peers for contributing to raising the professional profile of Capoeira while maintaining the essence of it’s origins. Gringo is a regular performer and teacher at West Australian Schools, Communities, Charity events, Corporate shows and Cultural festivals; travelling all around Australia to teach, and promote the many benefits of Capoeira and Brazilian culture. 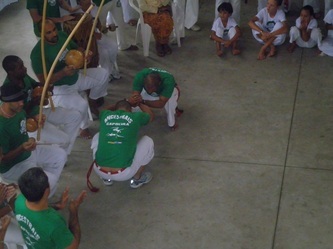 Leo Santos 'Gringo' was awarded with his Professor Cord in Belo Horizonte, Brazil in 2006 in recognition of his successful work promoting and developing Capoeira in Australia to the highest standards. It was Gringo’s greatest honour to receive his graduation from the Grand Mestre João Pequeno; one of the most respected Capoeira icons in the Capoeira world today. Change is a necessary part of life to achieve growth and development; it was a heart-wrenching but courageous decision for Gringo to 'walk with his own feet' when he left his old group. His philoshopy is to always look forward with positivity and good energy. August 2013 sees Gringo's commitment and passion to Capoeira come to fruition, with his graduation at the Festival International e Formaturas he is awarded the rank of Contra-Mestre. The ceremony took place in Belo Horizonte Brazil with many important guests, colleagues, students & family in attaendence. Mestre Museu - the Capoeirista who invited a very young Gringo to play in his first street roda (in BH) and a long time friend & mentor; felt honoured to be able to pass Gringo his new Contra-Mestre cord. C. Mestre Leo Santos ‘Gringo’ is Grupo Ancestrais Capoeira -Brazilian Dance & Cultural Arts, once again the work is intensive and requires the highest levels of dedication, commitment and energy… Ancestrais Capoeira was founded in May 2008 with Leo Santos 'Gringo'at the helm. Ancestrais Capoeira has a strong family focus with many children being welcomed into our groups around the world. These are the descendants of our Ancestors; the new generation of Capoeiristas coming up through the ranks; the future of Capoeira in our world. The Ancestrais Capoeira International Headquarters is in Australia under the direction of Leo; we have groups in Holland, Germany and Brazil. Ancestrais is indeed a fledgling group and there is much work to be done, but as Leo says “we must walk before we can run - our union and dedication will be our strength”.